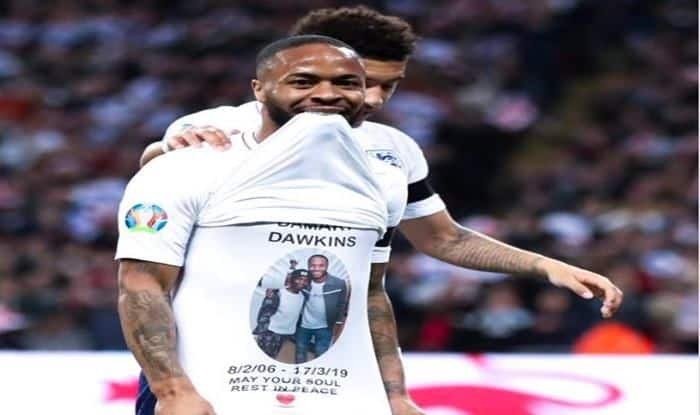 Raheem Sterling scored a hat-trick in England's 5-0 win against the Czech Republic at Wembley and used the celebration to pay tribute to a 13-year-old, who lost his battle with leukemia on Sunday. Manchester City forward Raheem Sterling netted a hattrick for England in the 2020 European Championship qualifying campaign against the Czech Republic at the Wembley Stadium in London. The Three Lions’ dominant display saw them win with a five-nil scoreline. After scoring his second goal, Sterling paid a tribute to the 13-year-old Damary Dawkins, a Crystal Palace youth player, who lost his battle with leukemia. The winger then made it 3-0 in the 62nd minute when the ball deflected off a Czech player and fell into his path then he held off his marker Ondrej Celustka, turning smartly and bending into the left corner. The City forward then earned a penalty just before the interval and captain Harry Kane made no mistake from the spot. He completed the hat-trick only six minutes later when he cut into the middle and shot from 25 yards with an effort which deflects off Celustka and beat the goalkeeper. He became the first England player to score a hat-trick at Wembley since Jermain Defoe in 2010. Tomas Kalas’ own goal in the 84th minute made it 5-0 and also ended their miserable night.